My my it is more than a bit dusty in here don’t you think? What! Almost a year and no posts? I think it is time Mrs Murfin puts her pinny back on, cleans up the place and writes something. I have been doing a lot of sewing, and a lot of knitting and crochet too, so it’s not like I don’t have stuff to show you. The weather has been nasty and I have cabin fever. So let’s warm this place up a bit. Don’ you love this divided fabric basket? Pattern by Noodlehead . I’ll make some tea and be back in a flash or in a day or two. 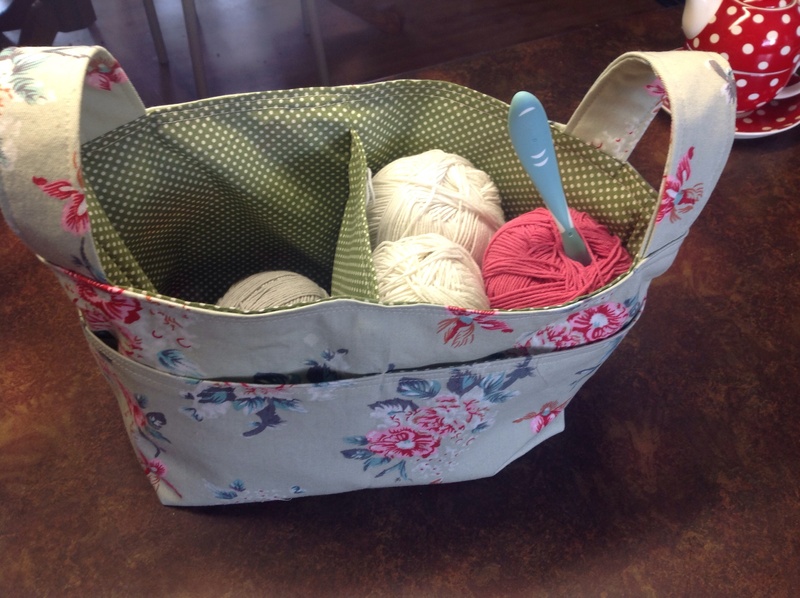 Thanks keepsmeoutofmischief I am itching to get into my sewing room this evening! Thank you! I will definitely look up the pattern! Hello Mrs M, love the basket. You’ll soon get the old placed cleaned up ready for shiney new posts. Thanks Carol! I would open the windows and let the wind blow through, but I might freeze! Welcome Back! Can’t wait to see what you post! Thanks Sib. Hope you are enjoying the warm weather and sun. Not much of that here.